Chapelgate 456 comprises of about 200 spacious, well appointed townhouses along Lavenham Court, part of Mays Chapel Road, Thurloe Drive, and Leister Drive in Timonium, Maryland. Our community is diverse and welcoming with residents of all ages and cultural and professional backgrounds. It was developed in 1992-93 by Pulte Homes, one of the biggest residential developers in the US and part of Pulte Group, Inc. You can get a feel of our community in any of the major search engines that offer street views in their map section. 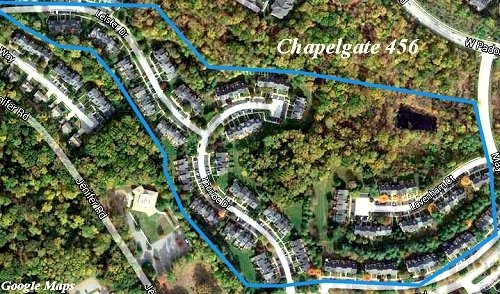 Chapelgate 456 is part of Baltimore County, and is NOT related to any other community with Chapelgate in its name. Chapelgate 456 combines the charm of quiet suburban living with the urban energy of Baltimore and Washington, DC. 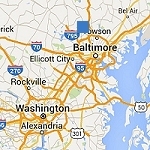 Our community is located about 17 miles north of downtown Baltimore, MD, about 50 miles from Washington DC, and 20 miles from the Pennsylvania state line. It is conveniently located minutes away from I-83 and the I-695 Baltimore Beltway, the major thoroughfares in northern and central Maryland. The Timonium area is served by the Maryland Transit system. There are three stations of the Baltimore Light Rail to downtown Baltimore and two of them are Park & Ride. The Light Rail it is also connected to the MARC commuter line and through that to the Washington, DC Metro system and several Maryland destinations. The Baltimore-Washington International airport is about 26 miles away and is served by the Light Rail. There are over 40 state parks in Maryland and 4 in Baltimore County offering a wide variety of recreational opportunities such as walking, hiking, biking, mountain biking, horseback riding, fishing, swimming, and canoeing. The great variety of the Chesapeake Bay and the Eastern Shore is within driving distance. The closest state park to our community is the Gunpowder Falls State Park. A few minutes of driving time north of our community is the National Central Railway Trail stretching to the Pennsylvania border. The trail is very popular for walking, running, and biking. Baltimore County also has many parks and recreational facilities. Closest to our community are the Oregon Ridge Park in Hunt Valley with a variety of nature programs and cultural events and the Loch Raven Reservoir with many hiking trails. LTRC (Lutherville-Timonium Recreation Center) provides many sports activities for all ages and the Towson YMCA a variety of wellness programs. Many private health, wellness, and recreation establishments (golf, swimming etc.) are also in our immediate area. In our immediate area there are several major retialers and many smaller ones within minutes along York Road, south and north of Timonium. To the south the Towson Town Center Mall is 15 minutes away and to the north the Hunt Town Centre is about 5 minutes away. The Towson area also provides many shopping and entertainment opportunities.